Below are are the 3 books on which you can vote this month, all 3 are fairytale retelling science fiction romance books and all three written by the same author. When you wish upon the stars… you might get more than you ever dreamed of. Stella wants nothing more than to be a pilot like her mother, who died on a mission years ago. However, she doesn’t want to be like the arrogant “Aces” at Starforge Academy, especially that show-off Dax. But the Aces aren’t her biggest problem. Her father — the Commandant of Starforge Academy — and stepmother won’t even let her enroll. Stella has to sneak into the flight simulators late at night, when no one’s around, to get close to her dream. Dax is like the prince of Starforge — not only the best pilot at the Academy, but the son of a famous general. No one knows his secret: Dax hates his superstar status, and he doesn’t want to go fight on the front lines when he graduates. The pressure to follow in his father’s footsteps has taken all the joy out of flying. When he discovers that someone at the school is beating all his scores on the simulators — and then hiding the evidence — he’s determined to find out who it is. Though he’s unable to discover his mysterious competitor’s identity, he learns enough to suspect that she just might be the girl of his dreams. Stella learns that the Academy is holding a school-wide exhibition of flying talent, with the winner allowed to fast-track their pilot’s license. She has to find a way to enter, and show her father what she’s capable of. But that will mean outing herself to the school — and the ever-more-intriguing Dax. Will her stepmother ruin everything, or can Stella and Dax finally meet outside the simulators… and achieve their heart’s desires? Welcome to Planet Neverland, where all your dreams become reality and responsibilities are a worry of the past. Wendy Darling has always been the dutiful, doting sister to her twin brothers, John and Michael, but she’s been so wrapped up in protecting them from themselves, that she never realized she wasn’t living her own life. The boys are tired of being stifled by Wendy’s smothering and long for adventure and excitement. They get more than they bargained for when they meet Peter, a street performer from another planet, on Earth seeking new additions to his show. Peter’s been in dire straits for a while now, after most of his crew disappeared without a trace. He’s desperate for more performers and happily accepts the twins into his crew — even if it means their bossy sister tags along. She insists. But Neverland isn’t as worry-free as Peter promised. His wasn’t the only show in town that had people mysteriously vanish and despite his burgeoning romance with Wendy, Peter knows his days are numbered. When her brothers are the ones in danger and Wendy risks herself to save them, Peter will have to face his demons once and for all, or lose everything. Melody is a woman bound by obligation. She loves her family, but can’t help dreaming of more. Exploring faraway lands, thrilling adventures, maybe even kissing strangers? Anything sounds better than caring for her sickly aunt and quiet, boring, small-town life. With quick wit, an easy smile, and that devilish twinkle in his eye, Konrad has always been able to charm his way out of every bad situation, and into every lady’s affections. His life is footloose, fancy free, and criminally funded — everything he wants it to be. He’s never slowed down long enough to consider any other possibilities. When a bizarre-looking alien from Celestial Mates knocks on Melody’s door, telling her that he’s found her perfect match, she thinks she may have stayed out in the sun too long. But after the cherub whisks her into a world of aliens, a tyrannical queen, and fearless rebels — not to mention the oh-so-charming thief who threatens to steal her heart — she’s just not sure she’s cut out for the life of grand adventures she’s dreamed about. If any woman had ever mentioned marriage or kids to him, Konrad would have been gone before she finished her sentence. But the longer he’s in Melody’s company — with her sharp wit and steel determination — the more his dreams are featuring picket fences and puppies. But Konrad can’t hide from his past forever and they’re both in grave danger as the evil Queen closes in. Will Melody give up her desires to go home, to live with him on the run? Will Konrad risk everything to settle down with the one woman who’s made him want to? How fun. I’ve never seen a Lady and the Tramp retelling so I had to pick that one. Me neither, I think that’s the first time I saw a retelling of that one. Trish @ Between My Lines recently posted…Twitteresque Reviews: 4 Books I loved, reviewed in 140 characters or less! I enjoyed the books by this author so far, they are fun. So I am looking forward to these. I went with Cinderstellar. Love the way it sounds and love the cover! I haven’t read a Peter Pan retelling so far either, so I am really curious about that one. I think it’s ahead in the polls at the moment ;). HOLY MOLY! This was hard! I went with Planet Neverland, not a Sci-Fi girl but I think I would read that for sure! I can’t wait to see which one wins! I thought it would be an itnerestign poll this time with three books by the same author and genre :). Planet Neverland sounds really good. It’s ahead in the poll at the moment. I voted for Cinderstellar but they all sound good! I went with Planet Neverland. It was hard to pick one this time. I thought it was fun to do a poll with these books as they are all by the same author and same genre :). I really like sci-fi, but am not usually a fan of fairytale retellings. But I do like this author’s books. Thanks for voting! 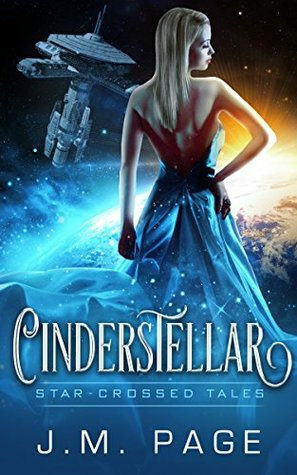 Yeah the Cinderstellar cover is a good one. This was tough! They all sound so good and I plan to add them to my TBR, I have a soft spot for Peter Pan so I voted for that one. I went with Lady and the Space Tramp, but they all sound fun! I agree, they all sounds fun. Thanks for voting! Cinderstellar. It just sounded the best although I don’t read retellings that much. Hope you get a good one! I don’t read retellings a lot either, but I do like the ones by this author that i read so far. Literary Feline recently posted…Sunday Post: It is Time For May’s TBR Poll & Free Comic Book Day! Planet Neverland won ;). I plan to read them all eventually :).